Following the collapse of the USSR, the world became unipolar and the USA gained control of the world as the representative of capitalism. The capitalist system found numerous new areas of expansion and the unchallenged political, economic, and military powers of the USA, led the American theorists and strategists to seek to create a world headed by the USA, covering all technological, managerial, IT, social and legal activities. At the same time the rapid worldwide developments in sciences, and management, and the electronic explosion, which enabled super fast transfer of information across all borders enabling people in all four corners of the globe to become aware of the living standards and welfare conditions of people in all other parts of the world, made conditions ripe for globalization in the sense of the spread of a world culture and unification of the people of the world. In the words of Kenichi Ohmae, a globalization theorist, the process of globalization embraces social, cultural and economic areas which are controlled by non-government organizations, private agencies, and international companies, with the market playing a very significant role in the new world order. Thus, the economically superior nations lead the process of globalization aided by international financial institutions such as the International Monetary Fund, the World Bank, and GATT or WTO (which replaced GATT in 1995). The governments of the developing countries now have to reduce their sizes and diminish their powers by expanding the private sectors in their countries, facilitating trade and exchange of goods and services and eliminating impediments to exports and imports. Globalization demands that markets merge, that work and capital are used worldwide on the basis of comparative advantages and increasing productivity in all factors of production, particularly work productivity, and reduction of production costs. All this brings the various nations of the world closer together as their interests become more and more inter-related. Cultural differences will consequently disappear, and stronger cultures will overwhelm the weaker and change them drastically. Information technology and the Internet have removed barriers to the flow of information and thus cultures. 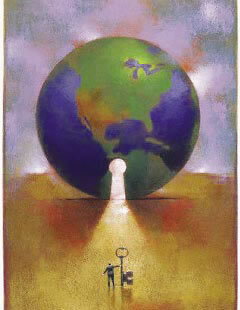 This is why many theorists consider globalization to be inevitable, the unavoidable destiny of the human race on earth. But there are some scholars who consider globalization not to be an inevitable and fortunate future for human beings but rather a plan formulated by Western capitalist strategists who have fabricated the plan for their own gains. But in either case conditions dictate that all the nations of the world should gradually turn into a single whole. In the new global environment the interests of all countries shall be safeguarded but the world shall be managed by international capitalism. Whatever decision is made in any remote part of the world, will rapidly affect the rest of the world. Therefore, it will be to the benefit of international investors to avoid crises and to strengthen and stabilize weaker economies. And international financial and monetary institutions have been created to absorb resources and create diverse markets and improve the economic and living conditions of people worldwide, which in turn creates new markets and free flow of capital and goods worldwide, and consolidates international capitalism. This would be quite different to the sort of imperialistic capitalism we have so far witnessed imposed by the West, notably by the USA since WWII. The theory of the New World Order as proposed by Americans, and effort to impose this order through invasions as in Afghanistan, Kosovo and Iraq and the Persian Gulf War in 1991 under various pretexts, at times with the approval of the UN and sometimes despite its disapproval, are not what advocates of economic globalization seek. In fact these actions are impediments to the emergence of the ideal globalization. Globalization cannot be confined to a number of countries only and to economic issues alone and will cover social, political, legal, cultural, technological aspects of human life all at the same time. In the political sphere, governments will be obliged to guarantee individual freedom, the people's satisfaction, and to protect the natural environment, and safeguard human rights. They must ensure that all the people of the earth approve their political performances and that the relationships between the governments and the nations are based on reciprocal respect and trust. The economic aspect will mean division of labor, free flow of capital and goods, free competition, production based on regional comparative advantages, reduction of costs of production and increases in incomes, economic growth, improving productivity and securing social and welfare systems and rapid flow of goods and services which will result in transfer of culture and technology. The global information technology eradicates borders and makes everyone aware of how others live and work in other parts of the world, eventually leading to closer cultures across the globe. Globalization will also demand ultimately a uniform legal system to rule in all countries of the world. Economic, social, and political rules and regulations will have to be the same everywhere to provide security for individuals and business entities. 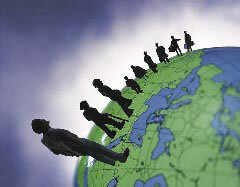 To prepare developing countries for a global economy, such international organizations as the International Monetary Fund and the World Bank allocate credits to the poorer countries for the development of their infrastructure facilities and economic and industrial systems and make suggestions and recommendations and offer solutions and strategies towards economic growth, enhancement of productivity and securing the peoples' welfare in these countries. This globalization is quite the contrary to the American theory of globalization as reflected in Samuel Huntington's New World Order. What we need is a gradual trend that will result in a better world for everyone, and no one, no nation, can ignore this trend and stay behind the movement. Any nation that ignores the trend is bound to soon become politically and economically isolated and will then have to pay dearly to join the globalized world. Today 146 countries are members of WTO. Put together they control 90% of world trade. They have set up immensely high tariffs on imports to these countries from non-member nations, which will make trade for non-member countries increasingly difficult. This will ultimately force such countries to seek membership as a matter of urgency. A simple comparison made between our own country and a typical country that is among the advanced in the global economy, reveals that the single most outstanding difference lies in the fact that in a globalized system the economy is run by NGOs, and private companies and organizations, in an atmosphere of free competition, which is not the case in our own country. Indeed this is a prerequisite for joining WTO. Other conditions for joining WTO include amending trade regulations, modifying customs tariffs, improving quality standards etc. But this is just on the economic side. Democracy, observing human rights, capability of governments… are other conditions that WTO imposes on member nations. Those who oppose joining WTO emphasize the danger of losing their own country's national and cultural identity to a single cultural identity that will soon dominate all member nations. This is the view of traditionalists, which is meaningless in a world of satellites, the Internet, IT and rapidly expanding telecommunications. If a single world identity or world culture is to come to prevail in the world, no one can stop it, member or no member. But only weak cultures are in danger. Iran has a history of several thousand years, a strong national identity, and a deep culture. It will not lose its identity but rather will contribute to the coming world culture. We have nothing to fear. In any case, whether we like it or not, we cannot build a high wall around our country and isolate ourselves from a world that is fast becoming one single entity through globalization.